Being a true fan of westerns I could not leave this movie unattended. And I was lucky to watch it in English at the critics` showing (in Moscow such an opportunity is often provided by the special hall at GUM Cinema Club). Maybe this is the key to the rare sense of involvement into the seemingly usual story of headhunters, Indians, outlaws and long wandering with troublemaking and adventure finding. I will try to avoid spoilers, just say that the movie is shot in a very simple manner but this makes it very atmospheric. The effect of presence is reached by the lonesome landscapes of the Midwest shot in New Zealand, natural lighting which is neglected in some movies even in outdoor shooting, and all the characters with no exception. They are never exaggerated or distorted, you won`t see here such a fault of a few latest westerns as super-cowboys, mega-Comanchees or ultra-sheriffs. It`s nice to see no useless visual effects or any computer graphics – the movie is true to all possible extents. And it is also silent, but it does not mar the impression. Moreover it falls into line with the spirit of the West – less words, more deeds. Short dialogues are filled with simple but philosophical sense, characters` offscreen thoughts reflect their mindsets and attempts to find their way where even the strongest ones get lost. Main parts are played by Michael Fassbender and Cody Smit-McPhee. They perfectly fit into images of the lonely wandering outlaw who knows the dollar price of everything in this world and a lyric youngster, the last romanticist in pursuit of his first, naive and overwhelming love. 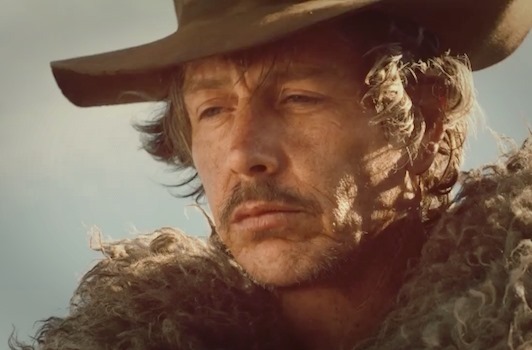 Although to my subjective mind the most impressive is Ben Mendelsohn who played the loose outlaw Payne, the most colorful and spicy antihero of the story. A perfect villain – treacherous blue eyes, an outworn fake Stetson hat, signature manners. Like a live illustration of the saying “The law of the West is the law of the gun” he does make you falling down the Rabbit hole of all his tricky episodes. It is like reading Thomas Mayne Reid for the first time, turning yellow pages of an old book feeling as you were there in that canyons with a cavalry SAA on your hip, or in a forest by a campfire with a rifle, hunting bears or headhunters. Take it with a grain of salt, but the outlaw is truly awesome! Director John Maclean and his team, previously made their mark on the Oscar-winning The King`s Speech, have reached the unique balance: they perfectly fitted the genre frames but made the movie special, they successfully mixed top famous cast with new talented actors, they made up a really deep story without unnecessary sophistication and finally they managed to revive the western. Western is back! Some people may argue – why back, since it has not ever disappeared, there are enough Wild West movies on screen. But still the very genre of western fell into the shade of more fashionable or topical plots. I mean the classical style of the western, with no alloy of horror or fantastic (I don`t count such a mixture of a good taste). 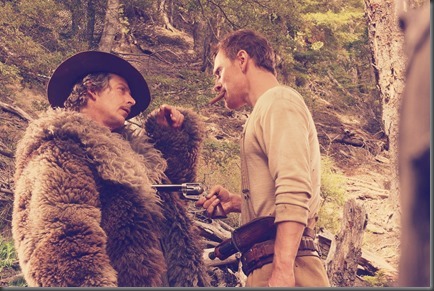 So, Slow West is a film of highest quality, a piece of a new classics, an example of a contemplative western employing the tool from literature – relating in first person with some flashbacks. 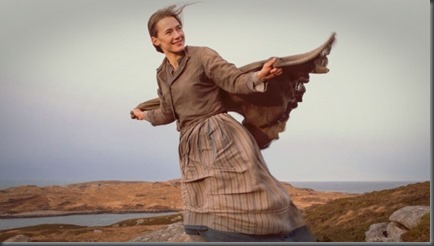 It might seem really slow, but the plot unwinds dramatically, holding us in tense anticipation and breathholding attention: chases and gunfire, love and friendship, tragedy and humour, everything is tangled in this story. The key philosophy of the movie is a controversy between choosing the path and destiny. The authors managed to reflect the desperate atmosphere of those days, featured with immense danger, limitless landscapes and roads. The cast along with shooting locations are beyond praise. I agree with the observer – Payne, the main baddie (Ben Mendelsohn) is awesome – this fantastic fur coat, a has-been hat, cunning smile and nothing good in his squinty blue eyes. He has a taste for good living: he drinks absinthe only from cut-glass winecups, never mind it`s somewhere by a campfire. Don`t be betrayed by his sleek manners and seeming light-mindedness, he is merciless and fearless. Screaming “Kill that house!” he calls his gang to level civilians` cabin to the ground. Being a bounty hunter all he needs is more peeps from WANTED signs, dead or alive. Developing the idea of the brilliant cast I can`t avoid saying that all of them talentedly live the stories of their heroes. 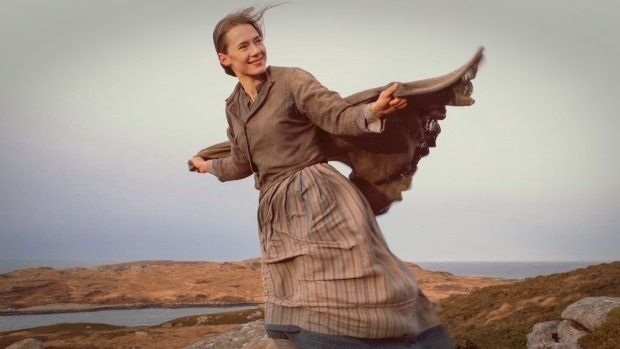 There are not many of them in the movie, and all of them are a hundred per cent true character, like Michael Fassbender (displaying a bounty hunter on his way to justice), Kodi Smit-McPhee (a young dreamer in pursuit of his love), Caren Pistorius (as a desperate Scottish girl Rose Ross). Supporting roles are not less success: a Native American who fell in love with Rose, another bounty hunter disguised as a priest, idealistic, but foxy writer Werner or the old outlaw of the Payne`s gang. The structure of the plot is outstanding as well. There is no simple division between black&white, all are killers to some extent and all are the victims. 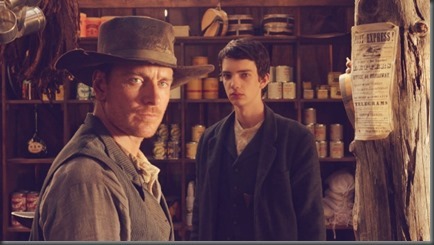 Payne`s gang goes outlaw but saves the orphans, or the brutal hero of Fassbender does not leave his young friend to death. The movie has reminded me of Appaloosa (2008) since both of them are a kind of a literature on screen, a novels about mysterious and unpredictable ways of good and evil. Both movies could have shared the motto of Appaloosa: Feelings get you killed. We are glad to receive such a detailed comment on this review, it`s nice to have a feedback from audience truly involved in westerns! 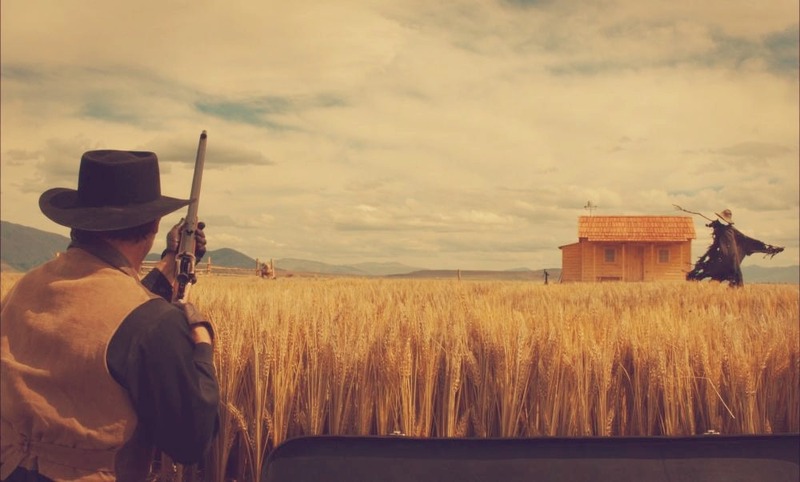 You`ve mentioned quite a core issue of modern western: the trend towards more contemplative plots and, the most vital – the revival of western as a genre. So another movie you`ve picked up as an example definitely follows this path of the, let`s say, new classics: full ‘cowboy set’, plus some earthling truth, plus a pinch of philosophy, simple and crude, as any banjo tune. And, by the way, soon I`ll come out with a review on Appaloosa. 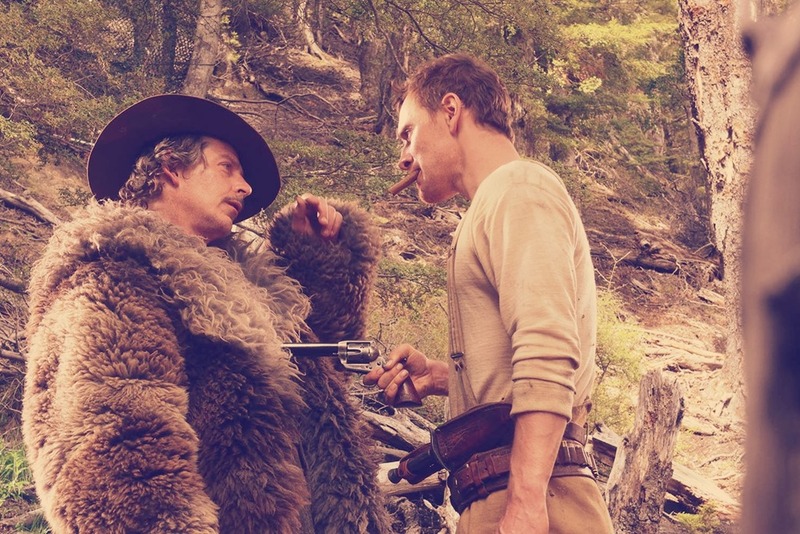 Getting back to Slow West I`d like to enforce you characteristics of the cast, saying that it`s not just a hundred per cent historical target hit, but also a heartbreaking performance, and a lady-killing cast – hundred points to Gryffindor (namely, to Fassbender and Mendelsohn`s ratings). By the way, your depictive comment has reminded me about some facts that I might have lost unattended in my short review. For example, it is a unique western shot far away from the US west, but I am really starting to understand why so many films are shot in New Zealand – magic of these landscapes can express everything, from fantasy range of cliffs to lonesome valleys of western. From hollow lands to hilly lands, quoting W.B.Yeats. 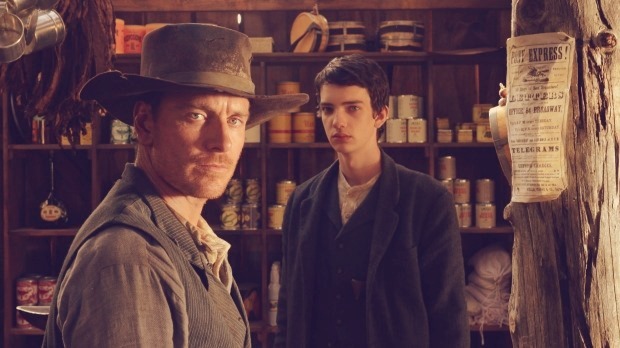 Maybe this choice of location made Slow West truly special – since the American west invites mostly to action, while these endless and meaningful horizons seem to stand still in anticipation of a new plot to be unwinded there. And, to stop talking the leg off an iron pot, and to add a bit of detail to your vision of characters, I`d like to remind the motto of Slow West: Wanted dead or dead. That was the private drama of Scottish runaways, that was the cruelty which a young believer wanted to break, that was the untold charter of Payne`s business, that was the reality of those desperate times.